Here’s a a little guide to Taos. Temps are rising but so are the bevy of activities in Taos, New Mexico. Whether outdoor activities strike your fancy, historic sites or an artistic education, we’re gathered our tried and true favorites for a summer to-do list while you’re with us. Golfing, fishing, horseback riding, biking–you name it, the Rio has it. But the most iconic adventure is braving the whitecaps and shredding the Rio. Lucky for summer travelers, the river is like bath water in the summer months. 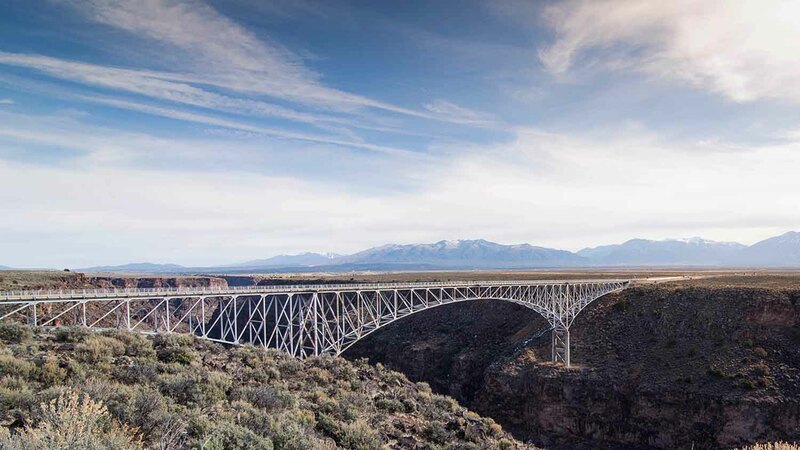 Don’t miss the Rio Grande Gorge Bridge, known by the locals the High Bridge, it’s the seventh highest bridge in the United States, stretching 10 miles Northwest of Taos. Breathtaking views keep locals and visitors alike coming back to this perennial favorite. When in New Mexico, do as the locals do. Southwest design is a large part of the culture in Taos. This museum is a collection of all things southwest from famed collector Millicent Rogers. The museum is home to large collections of Native American and Hispanic art. Don’t miss out on the museum store which sells local artisan jewelry, paintings and textiles. Step back in time at one of the most private and conservative pueblos in Taos belonging to a Tiwa-speaking Native American tribe of Puebloan people, still inhabited today. A vibrant and authentic community, residents sell handmade crafts and visitors can take tours of this historic landmark. A scenic route with winding roads, the High Road to Taos is hailed as a “must do.” 56-miles of desert, mountains, forests and small farms, this scenic byway is the perfect afternoon activity. Stop in Ranchos De Taos and snap a pic of the most painted and photographed churches in the nation– San Francisco de Asis Mission Church, and count yourself among the likes of Georgia O’Keeffe, Paul Strand and Ansel Adams.